for compatible wireless transmitters by H2O SOS. The Floodstopper wireless transmitter with built in sensor is used in conjunction with the FloodStopper receiver and any FloodStopper controller to create a truly wireless leak detection system. 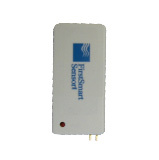 The wireless transmitter with built in sensor, senses the moisture and sends a signal in the event of a leak to a receiver attached to the main controller. The principal advantage of the wireless configuration is the ease of installation, especially where it is desirable to install sensors in locations to which it may be difficult or impossible to run wire. Up to 24 more sensors can be connected to each transmitter, and 32 transmitters can be connected to each receiver. Note: If you have not purchased a FloodStopper wireless receiver, you should not purchase this item. You should purchase the wireless add-on package, which includes a wireless receiver and one wireless transmitter, or one of our wireless extra value packages (comes with a complete FloodStopper system) first.